Three salad recipes in a single week. What can I say, it's been a week of salads. :) Today, I decided to take on a new challenge: Come up with an original egg salad recipe that I actually want to eat. LOL. OK, I'll fess up: The reason I'm creating an egg salad recipe that strays so far away from tradition is that, in truth, I really don't like traditional egg salad at all. :) For one, the typical stuff is usually rather bland and uninspired (Can we say "B-B-B-BORING!"?! ), not to mention that it often looks so pale that it looks like a vampire could've drained the color from it. For all the flavor and excitement factor that it has, it might as well be used to fill cracks in the sidewalk. ;) Meh. Plus, the traditional dish is really stock-and-trade, overly basic cooking that frankly just doesn't get me excited to cook. Hey, I'm the one making these recipes, so if I'm not inspired to make them, then you're in big trouble. LOL. There's a good reason why Erik has learned to just go with the flow: He knows that if I'm just not in the mood to cook something -- he's got an overdeveloped spidey sense for these kind of things -- he'd better not push his luck, or he'll wish he'd never asked. Haha! When I don't want to cook, look out. ;) I'm not exactly saying that I turn into a "kitchen witch" (remember those things?! ), but let's just say that sometimes there might be some attitude served along with the meal. ;) Yeah, even this chef has days when she feels like she'd rather phone it in. This is why, when I'm in a mood like this, I don't even have to recommend to Erik that he head in the other direction and not stop until he's far, far away from the kitchen. Hahaha. Also, as an option to serving this dish as a standalone side, you could also use it as filling for a totally new and different kind of egg salad sandwich. And finally, you'll be happy to know that this recipe takes under a half hour to make. And, minus the boiling of the eggs and the potato, there's basically zero cooking involved. :) So, have at it and enjoy! 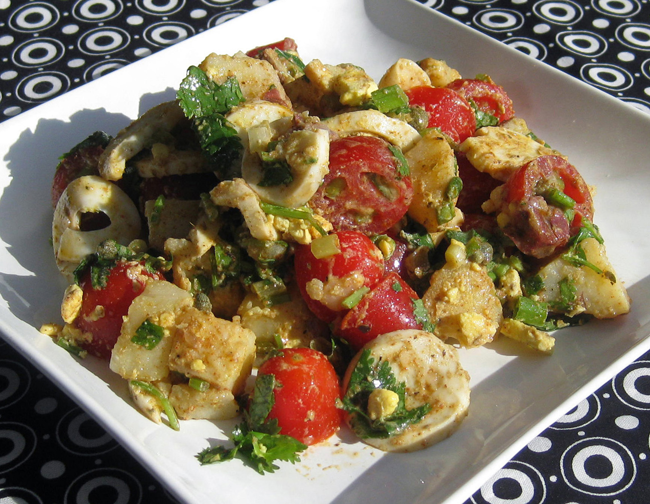 Directions: Place the grape tomatoes, scallions, cilantro, and capers into a large bowl and set aside. Bring lightly salted water to a rolling boil in a medium-sized pot, about 8 minutes. Then gingerly place the potato into the pot of boiling water. Reduce heat to medium-low, cover tightly with lid, and simmer for 15-20 minutes, or until the potatoes are almost tender when pierced with a knife. Drain into a heat-proof colander, then transfer potatoes back into the pot, and let them cool for at least 15 minutes. Set aside. Meanwhile, prepare the dressing: Pour all of the dressing ingredients into a blender (or food processor), cover, and pulse until smooth and emulsified. Pour into the large bowl of vegetables and gently combine. Set aside. This will allow the solid ingredients some time to marinate in the dressing while you're waiting for the potatoes to cool. When the potatoes are cool enough to handle but still warm, dice them into small, rough chunks while they're still in the pot. Then transfer the potatoes into the large bowl of vegetables. Toss well, then add hard-boiled eggs and gently mix together with salad tongs. Cover, and refrigerate for a few hours (or even better, overnight) to allow the flavors to meld. Serve cold or at room temperature. You're right, this is not a typical egg salad. It looks really yummy and so creative too! Hmm, I'm thinking tofu instead of the eggs (just because I don't eat eggs - not because I think there is anything wrong with your recipe). I might have to try that out, because it sounds delicious! I love traditional egg salad, but, alas, not eating eggs anymore.